Re-posted from My Head is in the Stars by ASP Astronomy Educator Vivian White. Welcome! These posts are all about an adventure I took in October 2014. 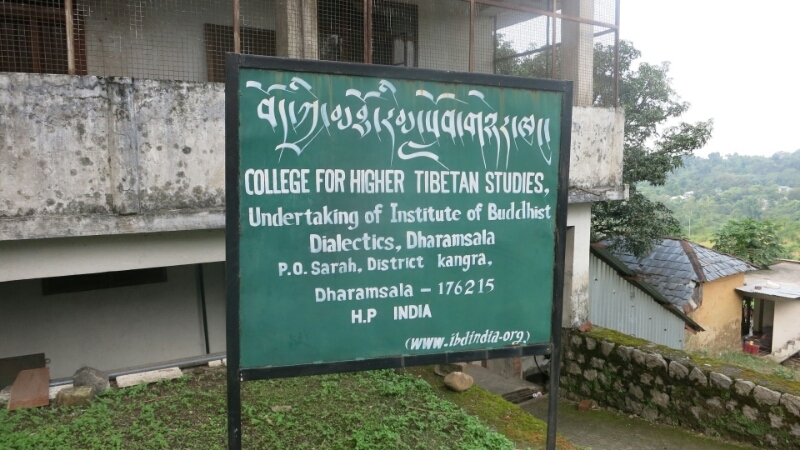 I had the honor of teaching astronomy to a new cohort of Buddhist monks and nuns in Dharamsala, India. They also learned about neuroscience, physics, biology, and more. The students are Geshes, directly translated as “virtuous friend” and equivalent to having earned their PhDs in Buddhism. They are learning science because of the vision of His Holiness the Dalai Lama, who believes that Science and Buddhism can enrich each other’s perspectives. This is happening as part of a larger science workshop under the direction of Science For Monks, an incredible organization. I learned so much more than I could teach. The 4 week institute started today! The opening day consisted of much chanting, an introduction from revered Geshe Lokdor, and a great overview of the philosophy of science by our fearless leader, Bryce Johnson. It’s astounding how much I take the scientific worldview for granted. I suppose in the west we’ve had 400+ years of practice. I’ll share here a couple of quick stories and then I need to prepare for my classes tomorrow. Thuptan Janyang, an older monk in the program, told me a sky story that “only the old monks remember” about the 7 brothers of the north. They woke up in the north, made a short journey and then came back to sleep in the north. I brought him a planisphere (the sky map that rotates) and showed him the Pleiades or seven sisters asterism that we know. If the map were designed for latitudes a bit further north, the siblings would indeed rise in the north and set in the north. Cool. In a late night conversation around the telescope last night, a very thoughtful Tomden (the same fellow who picked me up from the airport. Turns out there are so many Tenzins that most of them go by their second name. Previous plan foiled…) asserted that surely one of the goals of science is to relieve suffering. Think of all of the medicine that has helped people live longer. It made me tear up a bit, his confidence that science was benevolent in nature. I mentioned the atom bombs, a brutal example to the contrary. We talked for hours and I’m afraid I couldn’t defend science properly, as much as I adhere to its principles. Sigh. Tomorrow I’ll have loads to share after 3 hours with a translator talking directly with the monks. I can’t wait and surprisingly I’m not feeling nervous. Maybe the atmosphere of calm is contagious? I’m certainly sleeping and eating well. Every 2 hours there either tea or a meal! Scarcely time for a nap with all that sipping. Beautiful, simple life here. As much as I miss Ace, I’m really savoring all of the alone time. Also, I think he would love it here and hope to bring him someday. Two of the translators have a young son Pusan whose name means “good boy” and he’s very mischievous. I think they’d get along marvelously!